A murder mystery for the kids! It should come as no surprise that the diabolical Lemony Snicket is involved. The Composer Is Dead, but the inspector is on the case, interrogating the entire orchestra to get to the bottom of this hideous crime. 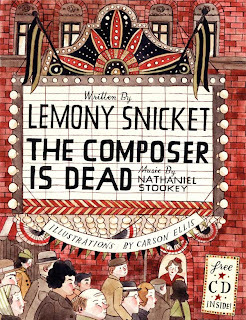 For all its wicked humor (the composer is "decomposing"), this book has a lot to teach children about the workings of the orchestra. It comes with a wonderful narrated symphony recording of the story with music by Nathaniel Stookey. The old-timey illustrations by Carson Ellis are pitch-perfect as always (Carson Ellis is responsible for so much of the amazing artwork for The Decemberists). It would be a crime not to share this with your kids.